Style, comfort and quality all come together in our beautiful selection of stackable banquet chairs. 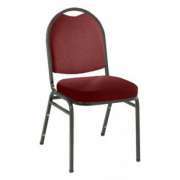 What makes banquet chairs special? Unlike regular stack chairs, they have padding and an elegant style. 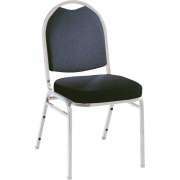 From cathedral backs to dome-tops, elegant fabrics to practical vinyls, we offer stacking chairs that are suitable for everything from banquet rooms to casual dining areas. Features such as waterfall seats and high-density foam padding ensure maximum comfort. With stain treatment, extended warranties and a wide range of options Hertz Furniture&apos;s banquet furniture provides the best in both durability and design. Formal events such as wedding receptions and yearly galas require furniture that suits the occasion. 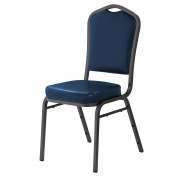 Churches and non-profit organizations which host formal events on a regular basis, should own some banquet furniture so they don&apos;t have to waste funds renting. Getting the right tables and banquet chairs to and from the desired location on time can be quite complicated. Having the furniture on site will save money in the long run and eliminate the hassle and worry. 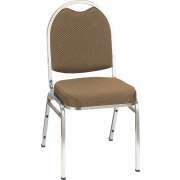 Banquet chairs are the ideal seating option for a social hall. 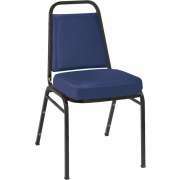 While there are other temporary seating options available, none are as elegant. 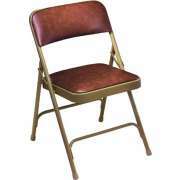 With padded seats and backs and stately designs, they offer the stability and strength of high-quality furniture with the versatility of portable pieces. What are the benefits of stacking chairs? Stacking chairs are always convenient to have around. They are designed to be piled high, saving space in storage and facilitating easy transport. Stack bumpers on their legs prevent them from getting scratched, so they will stay in great shape through many holiday parties and anniversary celebrations. When choosing stackable chairs for a specific space, it is a good idea to coordinate the upholstery with wallpaper or paint colors. If the room that the chairs will be used in has elaborate decorations, a simpler chair pattern might be better. Alternatively, a very plain room might benefit from chairs with a more lively and colorful design. 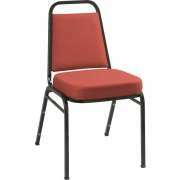 In addition to the color and pattern of the banquet chair upholstery, there are also different material options. For a less formal setting in which chairs will be used often, vinyl is a great choice. Vinyl is highly durable and very easy to clean. Fabric has a more elegant appearance and is available in a huge selection of styles. We have upholstery fabrics that will fit a wide range of budgets and rooms. 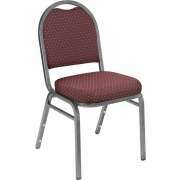 How do you choose banquet chair frames? 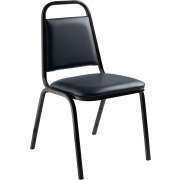 Another important component of stack chairs is the frame. 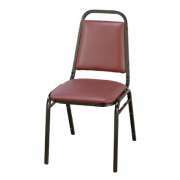 Frame material determines the weight capacity and strength of the chair. While chairs with less durable frames might seem cheaper in the short term considerations, stronger chairs will last longer and ultimately be worth the extra investment. Frames are available in a selection of finish colors so you can create the perfect combination of upholstery and frames. 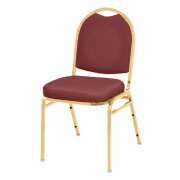 The shape of the top can be quite a distinguishing feature on a banquet chair. 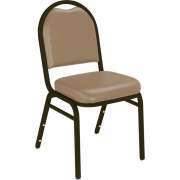 We have stack chairs with dome tops and oval backs as well as the classic rectangular back. Rounded tops have a softer, more stately appeal that can help make a space look more classy. 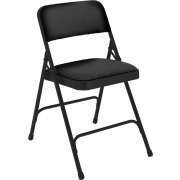 How thick should banquet chair cushions be? Appearance isn&apos;t everything, though it is quite important. The distinct padded backs and seats of banquet chairs make them suitable for all-night events. Watching people squirm during a speech or toast is never fun. When all party guests have a supportive seat, they will be able to pay attention longer and appreciate the speeches and dedications that many people have spent time preparing. Cushion thickness determines how comfortable your guests will remain throughout the evening, so it should definitely be a consideration when selecting stacking chairs. 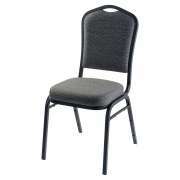 At Hertz Furniture, we know how important it is to find the right banquet chairs for your social hall. 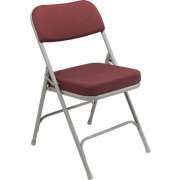 Our great selection of stacking chairs includes models that will suit a range of budgets, styles and preferences. If you need help determining the ideal seating for any space, contact the Hertz Design Center for free project-planning advice.